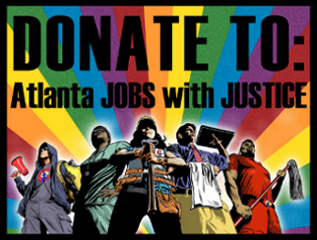 Atlanta Jobs with Justice believes that all workers should have collective bargaining rights, employment security, and a decent standard of living within an economy that works for everyone. For us to achieve this mission in Georgia, we must shift the power structures that hold our state minimum wage at $5.15 an hour. We want you and organizations with similar missions to join us to make Georgia a great state that provides good jobs with fair wages all working families. Sustainers are individual members who are committed to investing in the growth and development of Atlanta Jobs with Justice. Become a sustainer by signing up below to donate the equivalent of $15 or more per month. $62 a Year: Earn $15/hour or more. $25 a Year: Earn less than $15/hour. As a coalition organizing for economic and social justice we understand that almost half of all working Georgians make less than $15.00 an hour. Our coalition fights for all workers to be able to care for their basic needs. Together as members of Atlanta Jobs with Justice, we will build the power necessary to win for our communities and form a just economy.